Your real estate agent emails you the week's newly listed properties, but you just can't wait for Saturday's appointment. You pile everyone into the car for a nighttime drive-by. The street is so dark that you can hardly make out the house numbers. The coach lantern over the door is only enough to cast a small pool of yellow below. You roll down the window to get a better view, but the house looks lonely. Seller, for better or worse, your house has just made its first impression. Unfortunately, most working buyers are likely to drive by at night before deciding to make an appointment. Illuminate your house so that it is displayed like a fine jewel. This is not the time to reduce your electric bill! At the very least, leave the lights on in rooms that face the street until 10 pm. for that cozy "Thomas Kincade effect." Clean the layer of dust and bugs from your outdoor fixtures. If either side of the front facade remains in shadow (this often depends on streetlight placement), consider installing portable outdoor floodlights. 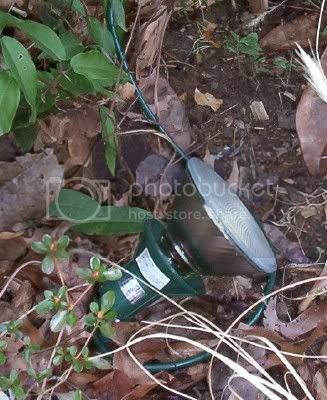 Don't confuse these with solar garden lights--they produce the landing strip look. You want a broad sweep of light across the front of your home. My husband installed two floods over the weekend. Each plastic receptacle costs about $5, with another $5 for the bulb. Receptacles have stakes which make it easy for you to "plant" them at different angles for effect. Thank you so much for this bit of info!! I would have NEVER thought of it. And our house(which we will be putting on the market in the next couple of months) is on a dark cul-de-sac. We did replace the front door fixture with a more up-to-date one. I will defintely be talking to DH about this.